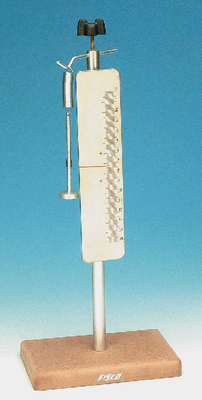 This sturdy Hooke's Law apparatus features a mirrored scale to eliminate parallax error. Mounted on a 30 cm support rod and wooden base, a hook supporting a coiled spring includes a mass hanger and indicator. The apparatus is marked in clear millimeters, so students can easily obtain measurements and record data using this device. The apparatus requires weights, available separately.